Have you ever started working on a project only to find out that someone else in your organization is working on the same project? Have you ever been stuck trying to research data in your organization only to find out the guy next door did all that research work last year, and all you had to do was go next door for your answers? Yep. Been there, done that – and from these experiences, I learned to talk more about projects I was working on. If only for no other reason than to stop doing double work, but the reality was that the greatest benefits turned out to be those that are outlined below. At the end of this post, look for a fab WOL support tool! I look forward to reading about what you are doing to “Work Out Loud” this week. 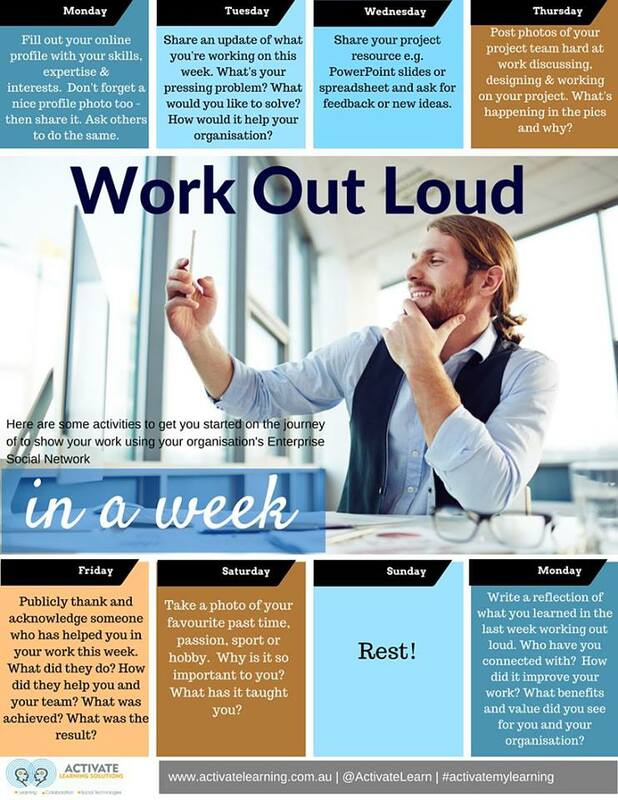 It’s time for WOL (Work Out Loud) Week. For the uninitiated, WOL is just what one might think, it’s about showing or sharing your work with others. Who the “others” are, is up to you. They may be your L&D colleagues or team, they may be business partners, other people from cross departments, your network or long suffering friends and family. The key here is to show it off, talk about the work and show your process. Organizations have long struggled with breaking down knowledge silos that create information hoarding. John Stepper seems to have started the WOL movement with his book “Working Out Loud” and others have followed in his foot steps, most notably Jane Bozarth with her book “Show Your Work”. 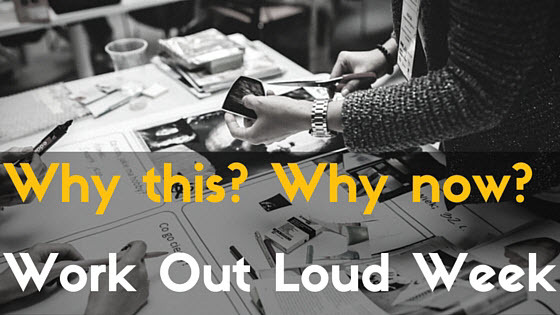 Call it what you will – “Work Out Loud”, “Show Your Work”, “Share Your Work”, “Scrums” etc. – They are all working toward the same goal: sharing how you do, what you do. The “How To’s”, the “Why For’s”, and the “Look At This!”. Why? Because when we share our work; we grow, we learn, and we collectively get better and smarter (therefore, more effective, productive and efficient). This not only applies to L&D but to everyone, regardless of business sector or department. John Stepper puts it this way in his post, “The Five Elements of Working Out Loud”. I understand there are many readers out there who “Work Out Loud” regularly making it part of your every day working life and cheers to you! Please jump to the bottom of this post and in true WOL style, share your experiences. To some of you the idea is foreign, if not a bit scary. Here we will talk challenges and benefits. I’m not working on anything worth sharing. Someone may steal my work. Who would be interested in what I do every day? I work hard every day and I’m not giving this information away. All true. To a certain degree. Let us debunk shall we? If you are not working on anything worth sharing and talking about – is it really worth working on? Just asking. Someone may steal my work. This is possible. Regardless, if you are working with some lowlife that steals work without credit, a pox on them! Just don’t let it deter from sharing and breaking down silo’s. We’ll get to the benefits in a moment. Anyone would be interested, because you are working on interesting stuff right? Your team is certainly interested and your network is interested. We all suffer from time to time with impostor syndrome, but trust me your work is great. I got nothin’ for this mentality. Working in silo’s is what has created the destructive workplace we have right now. We have all been victims cancerous workplaces – it’s a sad, sorry state of events when we horde information. Yep, it takes time. But not as much as you would think and it’s time well worth the effort. The gains to knowledge sharing are way more than the effort and more sustainable once you get started. Simon Terry – makes some great points regarding the benefits of WOL in this post: “You Can’t Predict the Value of Working Out Loud” so with this in mind, let’s break down the benefits into three areas. With your team: Think group share. Pick a problem project and ask three questions: 1) Where are you stuck? 2) What/who is holding up your idea? 3) What improvements would you like to make? 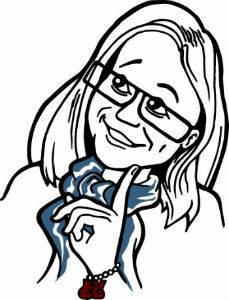 Choice a project that is going well and ask these questions: 1) What did your planning process look like? 2) How did make those big decisions? 3) What did your collaboration efforts look like? There are key learnings to take away from these discussions. Even just the idea of putting all the projects on the table will lead to discussions, “Hey, I didn’t know you were working on customer service – Sales just asked me for customer behavior data!” Now, you have synergy. DING! Share what you are working on the company blog and department newsletter. Not only does this make people aware that your department is alive and well but working on items that are mission critical. Extra credit: Ask for ideas to make improvements. “Work Out Loud” in a common area. You’ll get great feedback and all sorts of other side benefits, like perhaps someone stumbles upon you in the lunch room while you show off your latest widget design. Someone in your organization was struggling with how to create designs in general – now you’ve connected and helped. Excellent, you saved someone some time! The more we share information, the less people have to search for information. This is why people have an instruction manual drawer at home. It doesn’t do me any good if my husband keeps the dishwasher manual in the glove compartment of his car. The same holds true for organizational information silos. Take pictures of your work, share your progress with your network for ideas. Group collaboration, using all manner of internet based tools. Make use of your local ATD chapter meetings for help or ideas. Successful project outcome? Outstanding! Share the project to the groups, share the process and the result so others can take away ideas. Posting ideas, thoughts, success stories (and horror stories) helps other to generate thoughts and ideas and so on and so on. A week of working out loud. Monday: I posted a video outlining my plan for the week. Plus posted a few pictures reflecting a strategy meeting I was in (without giving away proprietary details). Wednesday: 1) Sending out “Anatomy of a Newsletter” 2) Talking to a college class about how to develop a learning strategy for an organization. This is set up as an “Ask me Anything”. A true WOL exercise. Thursday: Hosting an ATD webinar on Instructional Design, having some WOL moments with participants and their project work. Friday: Posting a “how-to” video for #RebelliousReaders newsletter group. How to access our FB page, sign up for blab and periscope, and discuss book options. Lastly, tips on how to start a #RebelliousReader group in their own organizations and make it successful. So you, my dear readers are my loosely connected network – and therefore, you all are loosely connected too. Isn’t it great when a plan comes together? If you haven’t already signed up the Rebellion Newsletter, what are you waiting for?